This .243 Winchester ammunition is priced for both hunting and target shooting and delivers excellent performance in both applications thanks to its soft point bullet. Pointed soft point (PSP) ammo has a sharper point than regular soft point ammunition, which helps make the round more aerodynamic and thus more accurate. 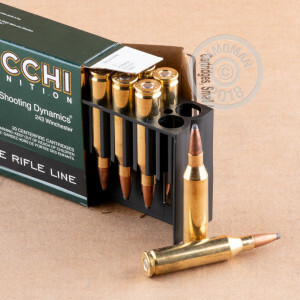 Each cartridge in this box of 20 fires a 70 grain projectile at a muzzle velocity of 3,400 feet per second, delivering nice groupings even at extended ranges. 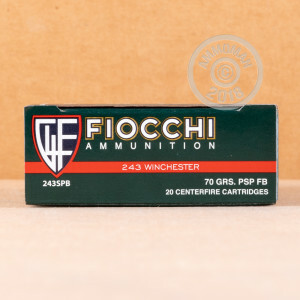 Fiocchi ammunition is loaded in Ozark, Missouri using non-corrosive Boxer primers and brass cases.